Patricia García: "These are unique moments in Spanish rugby"
In her latest exclusive column, Spain star Patricia García reveals the excitement in the country as the men's national team close in on qualification for their first Rugby World Cup in 20 years. 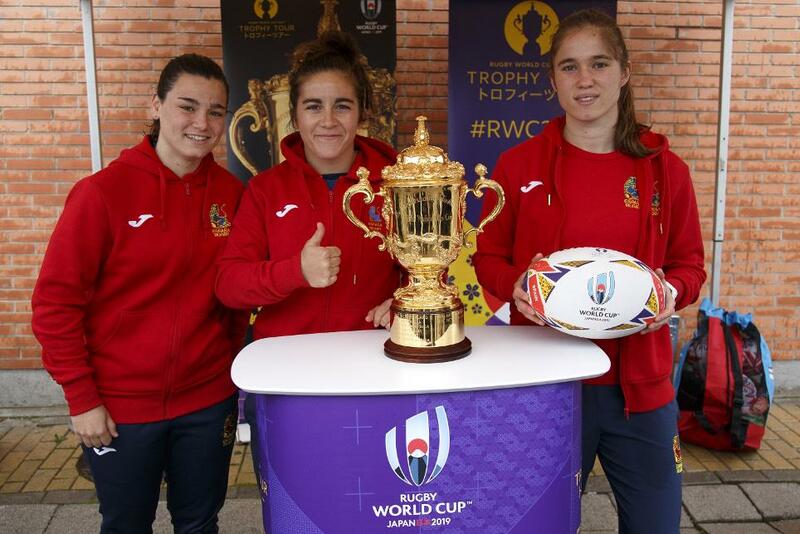 Spanish rugby is in a good position after some positive achievements over the last few years, including the men’s and women’s sevens teams qualifying for the Rio 2016 Olympic Games. We got an Olympic Diploma (top eight finish) in the women’s event and we also qualified for Women’s Rugby World Cup 2017 in Ireland despite the many difficulties we face in trying to compete at the highest level. Now is the time for our national men’s team to be able to compete on the biggest stage as they bid to qualify for Rugby World Cup 2019 in Japan on Sunday, needing to beat Belgium away to qualify as Europe 1 ahead of Romania. The whole team is working very hard and there is a clear effort from the Spanish Federation to invest in this project as it would be very good and important for 15s rugby to qualify for Rugby World Cup. It has been 20 years since Los Leones have been to a Rugby World Cup and it is very important that they get there, not only for rugby but for the whole of Spanish sport to be represented in the third most important sporting event in the world after the Olympic Games and the FIFA World Cup. Being there will give Spanish rugby a huge profile that would bring an injection of resources for the Federation that will hopefully help in making the sport professional. These last few weeks have been very enjoyable, seeing the Rugby Europe Championship unfold and getting so close to qualification. We’ve had high profile people watching the games, such as members of the Consejo Superior del Deporte (Sports Council) or the New Zealand Ambassador to Spain Andrew Jenks, with whom I watched the key game between Spain and Romania last month. This helped making Los Leones stronger and it all came to a climax last weekend in Madrid with the presence of King Felipe VI who wanted to attend and support the team to the extent that he walked on to the pitch at the end of the game with Germany to give them his most sincere congratulations and best wishes for qualification. These are unique moments in Spanish rugby, with the success of the women’s team in the recent Rugby Europe Championship. This may have been a ‘light’ tournament without the big guns from the Six Nations, but it is the tournament in which we compete. There has been positive media coverage with our success and that of the boys on their road to Rugby World Cup 2019, making it to the front page of sports daily Marca which only features bigger sports such as football and basketball. We were also delighted to host the Rugby World Cup 2019 Trophy Tour around the match with Germany, giving players – including me as you can see to the left! – fans and even the King a chance to get close to the Webb Ellis Cup and get a photograph with it. To summarise what has happened in the last two years, we’ve had Alhambra Nievas refereeing an Olympic final and being recognised as the World Rugby Referee Award recipient in 2016, our Olympic Diploma, the men qualifying as a core team on the HSBC World Rugby Sevens Series, our team going to Women's Rugby World Cup 2017 and recently being crowned European champions with a young, inexperienced team. Hopefully, this will include the highlight of our national team qualifying for Japan 2019 on Sunday and our women's team having a good Rugby World Cup Sevens in San Francisco later in the year.